DET (Die Evangelischen Theologen) is the theological version of a digital news magazine. 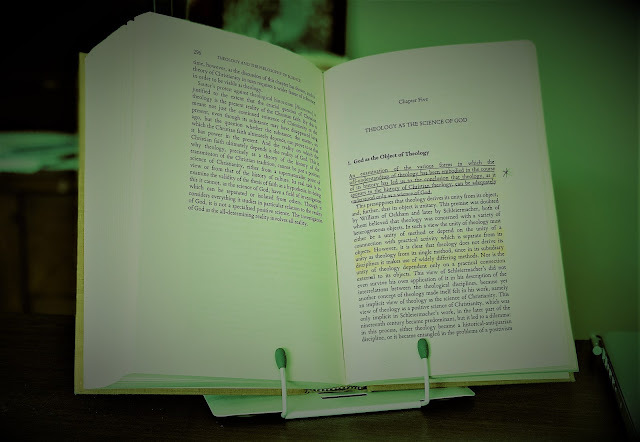 The DET authorial team provides insightful, thought-provoking content on a wide range of theological, religious, and even political subjects from current events and culture as well as from the Christian and other religious traditions. …or, The Past Fortnight in the Theoblogosphere. It’s been so, so, so much longer than a fortnight since the last link post - way back in…August. Lots has happened since then, obviously. Including Theology Beer Camp and ARR/SBL in Denver. And so on. For instance, we’ve also seen the shuttering of Faith and Theology, long a premier online theological contributor. One hopes that Ben will change his mind, or at least throw up the odd post from time to time, but at present things don’t sound to hopeful in that regard. In any case, it certainly makes one think. In more cheerful news, DET’s own Scott Jackson published a piece on Oscar Romero’s Political Theology over at The Christian Century, reviewing a recent book. That’s worthy of some celebration, in my humble opinion. Well done, Scott! Robert McAfee Brown (ed.? 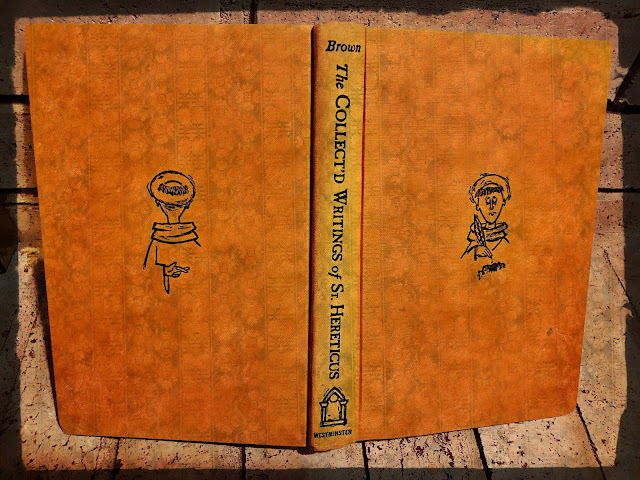 ), The Collected Writings of St. Hereticus (Philadelphia, PA: Westminster Press, 1964). Honestly, I’m having a hard time understanding how it is that only now in my theological education have I come across this gem of a volume. It is a must-read for anyone with a theological existence and a passing familiarity with 20th century theology and American church life. Seriously, do yourself a favor and get your hands on a copy. It will not fail to amuse and edify. In that spirit, therefore, I offer below St. Hereticus’s retelling of the Christmas story - his "Christmas carol," if you will. As The Saint notes, “I have left the text [of this telling of the Christmas story] in the American koine” of the 1960s, although he offers a number of suggestions as to the various source materials that undoubtedly hide behind the redactor’s hand. You can find the following on pp. 75-77 in the text cited above. I’m no expert on multicultural ministry. As a white male who migrated from the deep South through the Midwest to New England, I still struggle to come to terms with the racism encrypted in my own spiritual DNA and in the broader U.S. history and culture. Nor am I an ordained minister, but as one who has held lay leadership roles in congregations over the years, I’ve witnessed both the opportunities and the challenges of trying to live a life of faith within multiethnic and multicultural contexts. Wolfhart Pannenberg was one of the most important theologians of the 20th century. Most students (and hobbyists!) of theology will have come across his name in their reading. Some of them may have stopped and looked twice. But by that time they may have noticed that he published a lot, and his writing can be dense, so they may have decided to circle back to him later. Sometime. Maybe. It’s a shame, though, because that would mean missing out on some of the richest theology written in the last century. But what if these folks just need a little encouragement? A nudge to help them take a leap of faith into the Pannenbergian sea? That’s where this post comes in. I’m going to give you a brief overview of the life and work of Pannenberg, and show you why you should take the plunge! The last person to receive communion from Óscar Romero was an Episcopal priest from the United States. The Rev. William Wipfler (as we learn here) served many years as a social justice activist with the National Council of Churches, heading consecutively its Caribbean and Latin American Department and its Human Rights Office. Wipfler was part of a U.S. delegation, who met with the archbishop and participated in Romero's last Sunday mass, on March 23, 1980, before he was killed the following day while celebrating the Eucharist in the chapel at the hospital where his modest residence was. Assassination of a Saint: The Plot to Murder Óscar Romero and the Quest to Bring His Killers to Justice, by Matt Eisenbrandt (Oakland, CA: University of California Press, 2017). limitations of human existence. Surely he will come. He is the Angel of Death. death perfects life and ends its problems. In the 1580s, religious dissenter Henry Barrow languished in London’s Fleet Street prison, taunted by Anglican divine Lancelot Andrewes for his stubborn refusal to acknowledge the spiritual headship of King James I. Across the pond and the centuries, Baptist farmer-preacher Clarence Jordan endured derision and threats in the rigidly segregated rural Georgia community where he founded Koinonia Farm, an experiment in Christian communal living. Ok, ok. So it’s been nearly three months since the last link post. One of the things that university professors rarely see is just how much administrative work happens over the summer. Even if things haven’t been as hectic, I’d say that I’ve been pretty much as busy this summer as I was over the past academic year. Anywho, there has been a trickle of DET – and DET-related – happenings this summer, and this post will catch you up. Does this mean that you can expect an immediate uptick in activity? I’m not making any promises. Before we get to the links proper, I want to highlight two things in particular. Lately, I've become increasingly engrossed with the life and legacy of Óscar Romero (1917-1980), the martyred Archbishop of San Salvador soon to be beatified by the Roman Catholic Church. I am finding this material both inspiring and challenging, and am moved to ponder what this recognition means for the history of Christianity in the Americas -- indeed, for the Christian churches worldwide. In that vein, I've been ruminating on a short volume of excerpts from Romero's diary entries and homilies, which were broadcast from the archdiocesan radio station and served as a life-line of prophetic critique, journalism, and resistance in the months leading up to the civil war in El Salvador. The Scandal of Redemption: When God Liberates the Poor, Saves Sinners, and Heals Nations, By Oscar Romero (edited by Carolyn Kurtz) (Walden, NY: Plough Publishing House, 2018). Here's a book that was on my shelf for about three years before I finally read it. It was one of those situations where I’d wanted to read it but didn’t really have a reason until I needed to put together some lecture material for a new class on Christianity and politics. So I read it, and I was glad that I did. 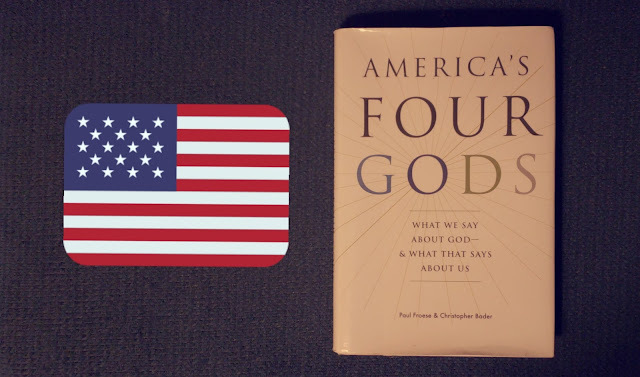 Paul Froese & Christopher Bader, America’s Four Gods: What We Say About God—& What That Says About Us (Oxford, 2010). I’ve been interested in Knox for a while. There’s a set of framed woodcuts in my office: Luther in the middle, flanked by Calvin and Knox. And I recently read a book about him. 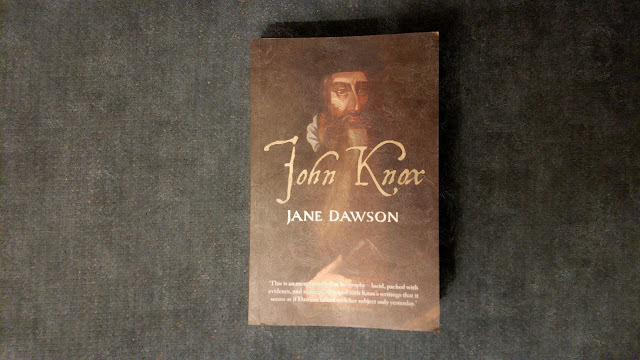 Jane Dawson, John Knox (Yale, 2016). I read a bit about Knox a few years back. At the time I was finishing my theology class with a unit on the Scot’s Confession, and I put together some lectures on its background – and that included Knox. Come to think of it, I wrote a review of one of the books that I read at the time: Rosalind K. Marshall, John Knox (Edinburgh: Birlinn, 2000). I enjoyed that book but it isn’t really a scholarly source and ever since I’ve been waiting for a proper, scholarly, thickly footnoted critical biography of Knox from an academic historian. Suffice it to say that I was very excited when Dawson’s book came out, even if it has taken me a couple years to read it. For those of you who don’t know this, students are awesome. I’ve been blessed to have had some really good ones during my years as a professor. And it’s always bittersweet when they graduate. Stop it. I’m not crying. You are. Anyway, some of said students did me the great honor of reading my book on Gollwitzer and then, as if that wasn’t enough, they emailed me with a bunch of questions for me to clarify about dialectical theology. And because they asked such good questions, I secured their permission to reproduce them here along with my answers. Their text is plain font while my interspersions are bolded. Looking for a good book to read? Check out the volumes below from DET! A post-Barthian doctrine of infant baptism? Talk about a must read! The revised and expanded proceedings of the 2010 KBBC - read up! Die Evangelischen Theologen by W. Travis McMaken is licensed under a Creative Commons Attribution-Noncommercial-No Derivative Works 3.0 United States License. Based on a work at derevth.blogspot.com.